India’s eCommerce marketplace, eBay released the India Festive Shopping Trends based on an analysis of all transactions on eBay India in October 2012. The report showcases interesting festive online shopping trends of India and its Top Festive Shopping Cities. Online shopping is main stream this festive season with Indian consumers across the length & breadth of the country going online for the best deals & widest variety of products. Delhi tops the rankings and shops the most in the festive season followed by Bengaluru and then Mumbai. The Capital City Delhi is all set to look good this festive season with most purchases from the Perfumes and Cosmetics category. Bengaluru is spending most on Home Décor perhaps to refresh their personal space and Mumbai turns techie by buying most Laptops & Tablets. 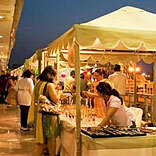 Interestingly, Surat is amongst the top 10 cities shopping online for the festive season. Interesting online shopping trends are seen in various parts of the country during this festive period with consumers buying cool gadgets & lifestyle products for both their own use & for gifting. Consumers are splurging on personal & home gadgets. As compared to last year, key products with a significant increase in purchases are Tablets & Tablet Accessories, Home Theatre & Accessories, Digital Cameras, Bluetooth Devices, 3D LED TVs, Smart Phones, Dual SIM Phones, and Furniture to name a few. The market has experienced increasing demand for big-ticket items that are being pushed through various marketing schemes. Retailers like Shoppers Stop, Lifestyle and Future Group, and consumer electronics companies such as Samsung and Sony felt that the festive season marketing has picked up early this year. They report that average billings sizes have increased 10%-15% and products such as televisions, smartphones and designer wear are moving off the shelf faster. Average ticket size at shoppers stop has increased to INR 3,500 from INR 2,600 last year. Average billing size at ITC Wills Lifestyle stores has gone up to almost. 4,500 this year from . 3,800 last year during Diwali. This is the trend this Diwali and it has been a cheer month for all kind of retailers. The shopping budget of customers has gone up despite all the speculation of tight pockets as a result of economic slowdown.